This week for maths, our task was to figure out this statistics problem. 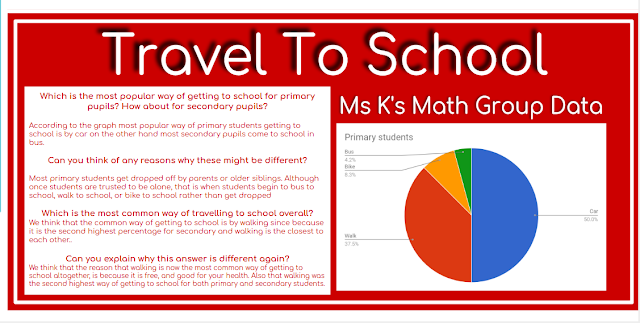 We found out that most primary students get to school is by car and most secondary student get to school by bus. After that we survey all the students in Ms Kirkpatrick's maths group. According to our survey most of the student in Ms Kirkpatrick's maths group get drop of school by car and the least amount of students come to school by bus. For this task I've decided to work collaboratively with Sanujan and Ofa.